You know what they say about London buses? Yes, of course you do. In a similar vein, it seems that Apple just can’t get enough of releasing new products this week. After two new iPads on Monday and an updated iMac on Tuesday, Wednesday 20 March has seen the announcement of the long-awaited AirPods 2. “The world’s best wireless headphones just got even better with the new AirPods” stated Phil Schiller, Apple’s Senior Vice President of Worldwide Marketing, in an accompanying press release. Big talk indeed, especially given that we thought the original AirPods were so good that they’d be nigh-on impossible to improve upon. Apple claims to have achieved just that by including a brand-new, purpose-built H1 chip, hands-free Siri and a new wireless battery case, amongst other things. Read on for the full lowdown of everything we know about AirPods 2. AirPods 2 release date: When will you be able to buy them? Given how well the original AirPods sold, a successor has always been likely to materialise. The only surprise has been that we’ve had to wait this long. However, I’m pleased to report that AirPods 2 are available to purchase from the online Apple Store from today (Wednesday 20 March), with shipping beginning next week. If you’re keen to avoid ordering online, you’ll have to wait until next week for the new earbuds to be rolled out in physical Apple Stores nationwide. AirPods 2 price: How much do they cost? AirPods 2 are available in two varieties. They’ll cost you £159 with a standard charging case, or £199 with the upgraded wireless charging case. Alternatively, you can purchase the wireless charging case on its own for £79. AirPods 2 design: What do they look like? 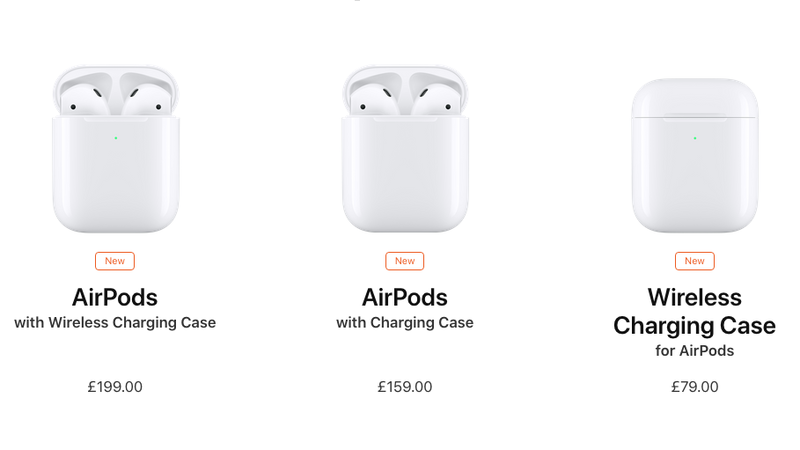 Even the most ardent Apple supporter would be hard-pressed to spot the difference between the new AirPods and their predecessor. They’re the same familiar looking white earbuds with a long stem that fit neatly into the charging case. Despite some rumours to the contrary, they’re only available in classic Apple white, and not the range of colours that some commentators were expecting. There were fears that increased battery would require a larger and heavier charging case but, at least from the images we’ve seen so far, it appears that Apple has managed to avoid this. AirPods 2 features: What do they do? Although AirPods 2 don’t feature any drastic changes in terms of aesthetics, there are significant internal improvements. The first of these is that you can now access Siri through the earbuds simply by saying the words “Hey Siri”. In a similar vein to rival earbuds that feature Google Assistant integration, this means you can get the information you require delivered straight to your ears, rather than being forced to faff about with your smartphone. 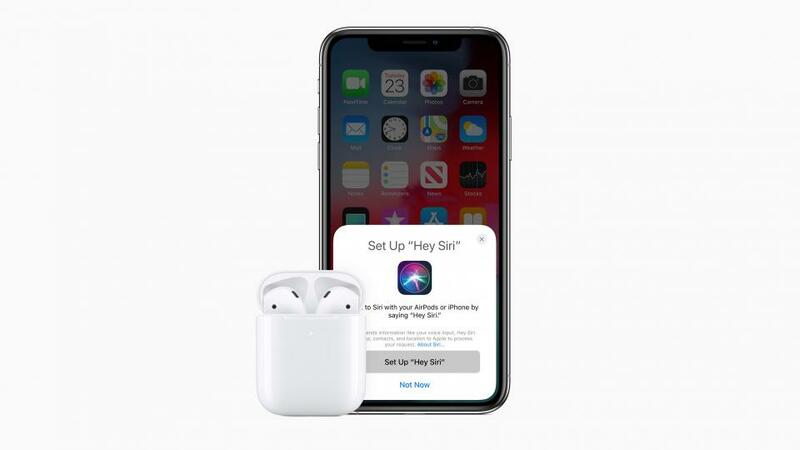 Battery life has also been significantly improved: Apple has stated that you’ll get a full 50% extra talk time compared to the previous AirPods. That only equates to an hour, but we’re happy to presume that this also means their stamina when listening to music will have also improved. Thirdly, and as we have long-expected, the refreshed AirPods come with the option of wireless charging. However, this isn’t the default and, as you may have already noticed in the pricing above, it will set you back an extra £40 compared to the standard option. You’ll also need to own a third-party Qi wireless charging mat to make the most of this feature, since Apple doesn’t currently supply one of its own (we’re looking at you, AirPower). Happily, though, these can often be found for as little as £15 on sites like Amazon. Other than that, not much has changed. AirPods 2 will still be ultra-portable, pair easily with your smartphone or other device and deliver surprisingly good audio quality. We’ve waited a long time for the release of AirPods 2 and it seems, at least for now, that Apple has delivered significant improvements to the originals, whilst retaining every aspect that made the latter so good.